I want to say what I said in my other blog about my solar purchase. 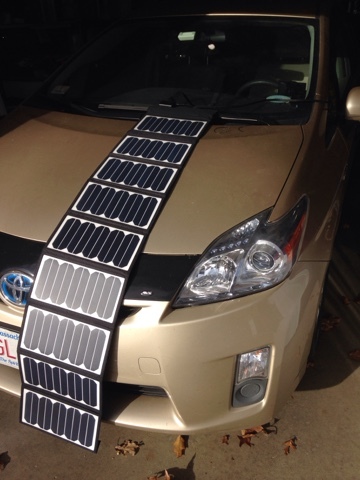 That is; Having a Prius Hybrid means you do not need solar for charging your house battery. The Prius is a great generator and has worked fine charging my house batteries over the last two years. Therefore, the reason I am undertaking adding solar is to try it out for future knowledge and to assist with charging the house battery when stationary, and yes save some fuel. I have been in technology all my life and I felt I was missing out by not having any solar experiences. People would ask me and I couldn't offer any knowledge. This is my entry into the brave new world of Solar but also my entry into the LiFePo4 battery technology too. Charging LiFePo4 batteries requires a LiFePo4 charge controller. Not all batteries charge and float at the same voltage. This is why when I had gel cells for my house battery I had a charger that would charge them correctly. 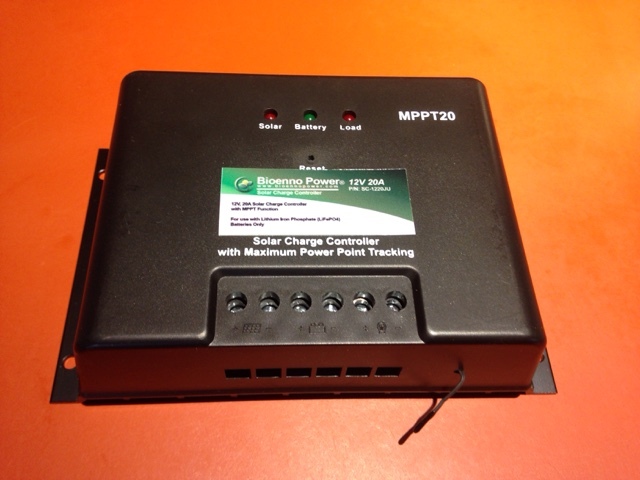 I can only charge my LiFePo4 at a maximum of 10 amps, but I chose a 20 amp MPPT charge controller so I will have the ability for future capacity if I decide to expand my battery and solar system. Notice the small wire coming out of the bottom of the charge controller (above). This is the thermocouple to measure ambient temperatures. This helps keep the charging of the battery correct based on temperature. If I wanted to increase my solar I can control the amps going to my controller by limiting the wattage of my solar panels. I can go up to 180 watts to match the 10 amps charge rate of my current 40 ah LiFePo4 battery. I chose Bioenno for the charge controller as I also bought the battery and charger from them. I had a number of communications with Bioenno before I bought my battery to ensure it had the protections built in and that I could get a battery with fast charging. Although they offered that I could buy any LiFeP04 charger and solar charge controller as long as they were designed for LiFePo4, The cost savings to buy other company products wasn't worth the savings to have a totally compatible system that the battery has a good product warrantee that is prorated. 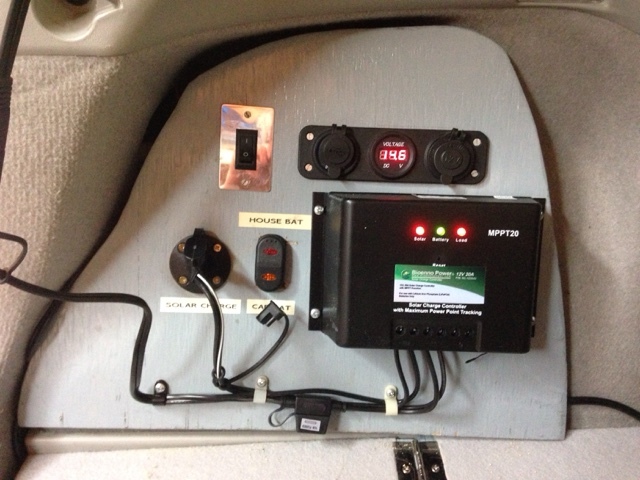 My first step was to mount the solar charge controller to the house battery panel on the rear drivers side. From my other posts, my house battery is below the panel and battery charger is behind the panel. 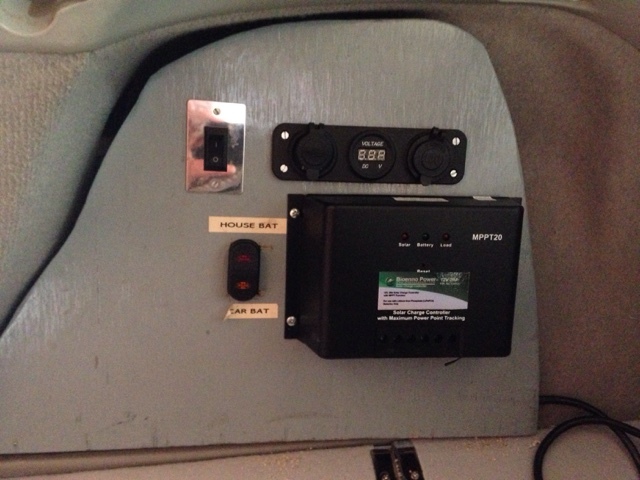 Since I feeding power to these circuits from my solar it made a good spot to mount the charge controller. It also gets good airflow but I don't have to worry much about this as this unit is rated for 20 amps and I will be processing no more than 5 amps with my 60 watt solar panel. Next I mounted the two-wire connection to the left of the charger switch. This connection is used to connect the battery to the charge controller. I also labeled it before I ran out of tape to finish the labeling below. The two items seem to fit well with the space I had available. I certainly didn't plan it that way. I connected the quick connect wire from the LiFePo4 battery to the panel battery connections and made the connection inside with a quick connect 2-wire wye. You may remember that I use these quick connections to provide for ease of modification and upgrade. Then it was time to connect the soar panel. This too has a quick two wire connect and is to the left rear. You can see I am charging the battery at 14.6 volts off the 60 watt solar panel laying on the hood of my Prius, as I continue to work. 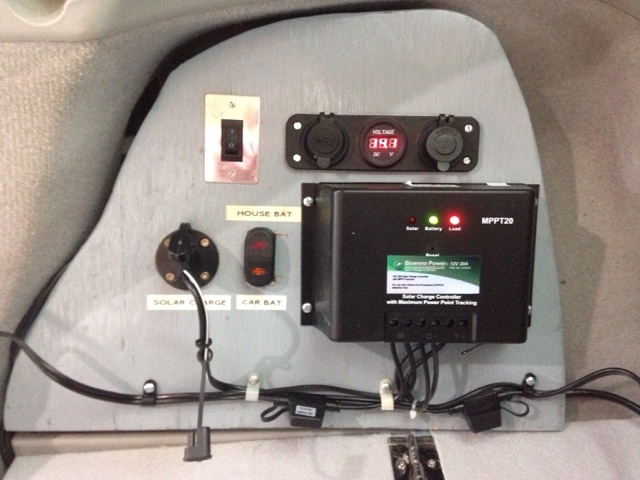 The unloaded voltage off the panel is 19+ volts so the charge controller knows to supply a charge voltage until the battery is full and then it goes into float charging. Above I connected a 2-wire quick connect to the load connections on the charge controller.. Seen on the bottom right. From my LiFePo4 battery blog post you may have picked up on the fact that it is not recommended that you draw a load off the battery when charging, so the battery BMS (battery maintenance system) circuit inside the battery can balance the battery. It is physically possible to charge and carry a load and I don't know if this is a problem if you do it from time to time, but the BMS is meant to give your battery longevity (over 2000 charges) by balancing the cells inside. Well, when reviewing this issue of charging and carrying a load at the same time with Bioenno Power they said that when using the LiFeP04 charge controller I can run a load off the system using the load connection on the charge controller while charging. So my plan when running solar to charge my house battery, I will plug in my Engel compressor fridge off the charge controller load connection thus not having to run my Prius in "Ready Mode" and therefore saving gas. For my other friends out there with Prius living arrangements, the amount of gas is not that much based on my experiments last year, but every little bit helps and will help return some dollars on my solar investment. Lastly, here is my updated circuit design with the addition of the wye connection. 1. My house battery feeds this panel (through a switch) that includes a dual USB connection and one cigarette outlet and a volt meter. 2. I can charge my LiFePo4 house battery with a LiFePo4 specific 10 amp charger that is powered by 120 volts (charger is top center). The charger gets 120 volts from a 400 watt pure sine wave inverter off the Prius vehicle 12 volt battery on the opposite rear side of the car. I charge when I drive or when I park the Prius and leave it in "Ready Mode" that allows the high voltage drive battery to supplement the 12 volt Prius battery and the Prius only runs when the high voltage battery needs recharging. 3. With this addition of solar and solar charge controller I can charge the house battery with solar, although a bit slow at a lower amp rate, but it works. 4. Future - I am working on a direct 12 volt to LiFeP04 charger to eliminate the 120 pure sine wave inverter. My research and designing is currently underway and I should have something to blog about in a couple weeks. Hi Brent, could you please tell us the length & the width of your 60 W solar panel . Ahhh also, are you able to roll the panel upon itself to be able to store it ? First- Yes the solar panel folds up upon itself and stores with the outer material covering protecting the solar panels. It ends up a couple inches thick and just over 11" wide. Second- here is the write up / specs for the panel. Amazing Efficiency: Constructed of high-efficiency solar arrays, up to 23.5% efficiency, easier and faster to replenish juice for your hungry gadgets. USB port(5.5V/2A) for charging your 5V powered gadgets,such as iPhones, iPads, Samsung Galaxy Phones, Acer, Asus, Dell, HP, Toshiba, Lenovo Notebooks and 15V DC output(15V/4A) for charging your laptop or storage battery. PET plastic faced solar panels sewn into high quality waterproof canvas for outdoor durability and long lifespan. Package contents: KINGSOLAR™ high efficient 60W solar panel, laptop connectors, charging clip. Have you done a back of the napkin calculation on the payoff based off your usage/gas savings over the last month or so? I'm guessing it would be in the "take longer than you'd own the car" kind of thing, but just curious. It's a well thought out system, I'm curious as to your feedback on how you like it vs. not having it other years? For me moving to LiFePo4 was a move towards savings. With my LiFePo4 battery I won't need to run the Prius that often to recharge the batteries. I will have more power to run my fridge before I do charge, and since I drive so often, I doubt I will have to leave the Prius in ready mode to charge very much. As for the LiFePo4 cost benefit, I don't have any calculations. It will save wear on the engine and some fuel and increase my mpg, which is all good. A pure guess would be a 3 year ROI on this alone. The move to Li was much more about my convienience. Now to the solar savings. I installed the solar solely for personal interest and experimentation. I was not expecting much ROI, but I know I will have some. Say I use 20 AH a day at the RTR and I don't drive that day. I save 2 hours of running the Prius engine in ready mode. My guess would be 15 min run time an hour in ready mode (needs to be verified) for two hours of charging I will save a half hour of actual engine run time a day. I don't know what exactly this savings will be but I will be a savings. The problem is that I have have a hard time not moving around, i.e. Going to McDonalds for WIFI so there is 15 minutes each way from RTR so I can charge while driving this leaving solar to make up the rest. The real benefit for solar is maintaining the nearly full battery leaving less ready mode time on the engine. 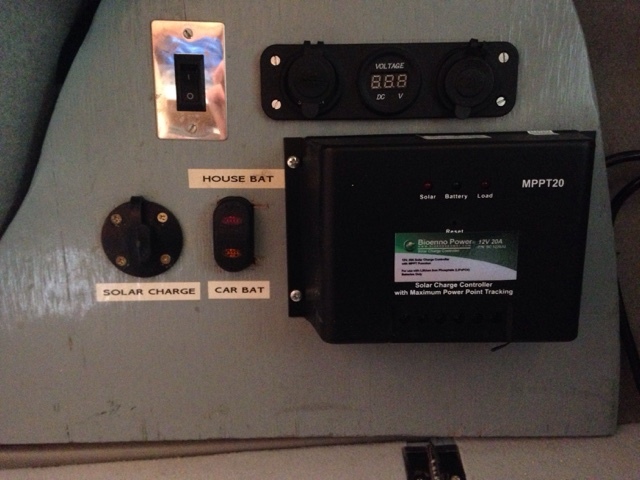 Just a thought Brent perhaps instead of connecting the solar charge controller to a solar panel you could connect it to a 12 V outlet in the vehicle when the car Is running to charge the LIPO bat. Maybe this could be used for DC to DC charging of the LIPO batt instead of using the AC to DC charger and you wouldn't have to listen to the fan noise from the ac to D.C. Charger? 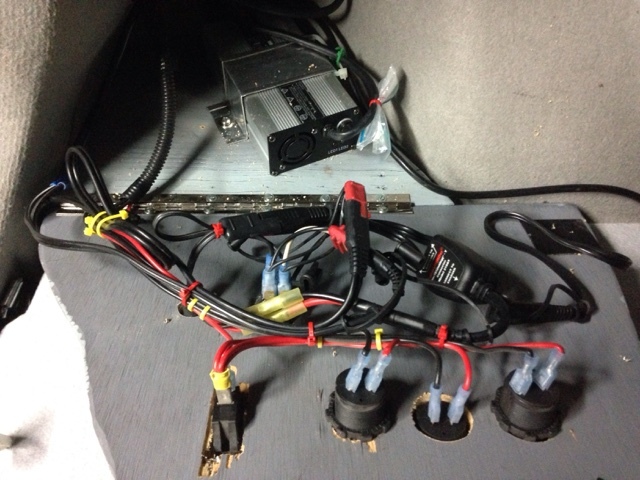 Hooking the 12 v vehicle voltage to the charge controller would work if the voltage from the vehicle is high enough. Even though the Prius uses an AGM battery and can charge at 14.6 volts, I don't believe it is satisfactory for the solar charge controller to operate and properly charge the LiFePo4 battery at nearly the same voltage. I did look at the Bioenno specs for the 20 amp MTTP charge controller I have and it does not specify minimum input voltage, but solar panels usually have 18 volts at the lowest output from the panel and this is what my panel delivers. I do know the controller does shut off at low input voltage, but I never tested this. A test may be appropriate for me in the future. The suggestion I have made regarding D.C. To D.C. Charging through the solar charge controller would be to use a step up transformer say a 1/2 ratio to get the input voltage up to 26 to 30 D.C. Volts and the charge controller would just think it was a well performing solar panel. The charge controller is speed to accept less than 70 volts. Although I have not tested this, there is no reason for it not to work as you suggest.